How about trying some local food in the luxurious Ginza district? 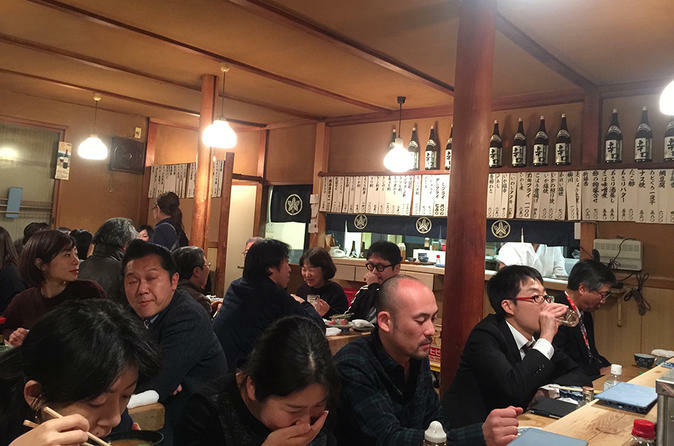 Your knowledgeable and entertaining guide will take you to a non-touristy Izakaya in the Ginza district where you can feel like a local. Your guide will also give you an explanation about each of the local foods and drinks you encounter, so that you will learn something new about the food you are eating! You will visit two local Izakaya (Japanese pub/tapas bars) where, although these are located in the heart of Ginza, foreigners are hardly ever seen. These bars are usually located on backstreets and not listed on sightseeing guidebooks. They don't have English menus or English-speaking staff, but with this tour, a local guide will help you order tasty Japanese dishes for you and explain what you are eating or drinking. This is a perfect opportunity to learn about the local tradition, culture, and food and will definitely be an unforgettable experience! Enjoy the nightlife at Ginza's local bars!